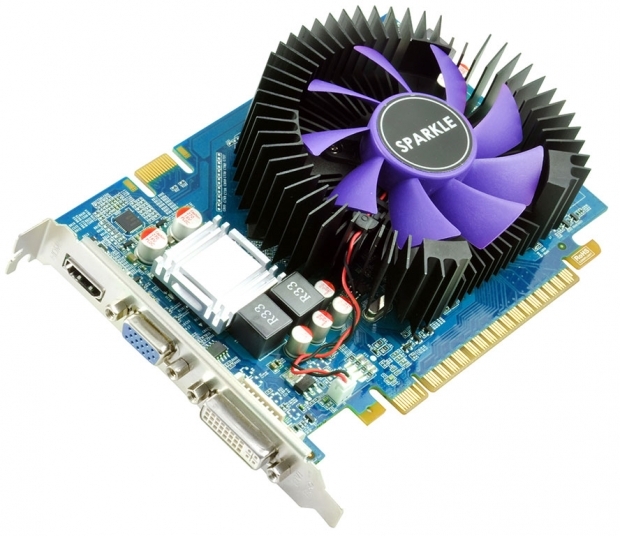 SPARKLE GeForce GTS 450 1GB/2GB DDR3 Graphics Card features SPARKLE exclusive designed Sun Flower Cooling Fan, which replaces NVIDIA reference cooling fans on ordinary GeForce GTS 450 graphics cards. This exclusively designed Sun Flower Cooling Fan uses SPARKLE patented technology known as "aluminum extrusion production processing", transferring heat from the bottom of the radiator to the cooling fin efficiently and fast. It also uses a "pressure casting" process, to make the entire cooling radiator at once, this process can not only brings sufficient cooling fins, but also bring heat from the bottom to the fins rapidly and efficiently, thereby improving the overall thermal efficiency, coupled with the design of solid thermal conductivity, heat from centre bottom can be brought even quickly to fins. The SPARKLE GeForce GTS 450 2GB DDR3 Graphics Card comes with incredible large 2048MB DDR3 video memory, an ideal capacity for driving multimedia center PCs while enabling smooth gaming in latest and hottest DX11 game, such as Stalker: Call Of Pripyat, Metro 2033, even to meet the requirement from 3DMark 11.